Familia Martínez Bujanda offers customers the chance to enjoy exclusive wines that are not available in the market. These wines are carefully selected for their quality from the winery’s best vintages, and are then aged in our premises to make fine wines that live up to the expectations of the most demanding wine connoisseurs. 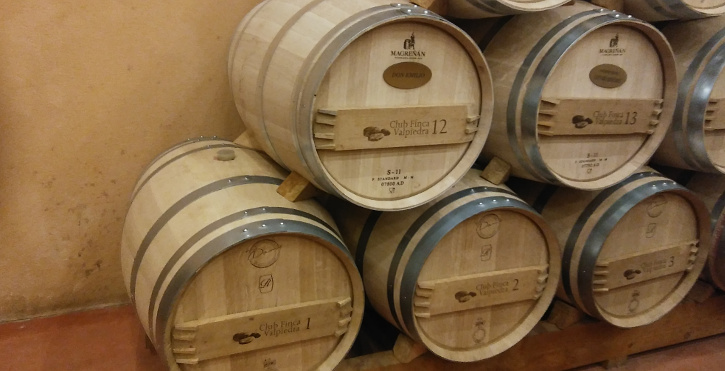 According to the regulations in force, reserve wines must be kept at least three years in the cellar before being sold, aged in oak barrels for one year. Traditionally, however, reserve wines used to be a winery’s best wines, regardless their ageing method, kept by the owner himself for later consumption. Finca Valpiedra Barrel Club, QDO Rioja: Finca Valpiedra Club wine. Finca Antigua Barrel Club, DO La Mancha: Lauren Rosillo Selección Epecial wine. As a response to individuals’ and companies’ demand for the creation of a Club of Friends for wine lovers, in 2005 we established a Barrel Club at Finca Valpiedra. The Club’s first-ever quality wine choice was from the 2001 vintage. Since then, we have chosen our very best grapes every year to make an exclusive wine under the label ‘Finca Valpiedra Club’. The wine is made with grape varieties such as Tempranillo, Graciano and Maturana. It is aged for two years in new French oak barrels. Now, the 2010 vintage is available, considered by QDO Rioja as excellent as a result of the year’s balanced average rainfall, optimal grape ripening and low alcohol content. The 2010 wine is elegant and balanced, making the perfect match for red meat, game or medium-hard cheese. Since the exceptional vintage 2004, Lauren Rosillo Selección Especial is made with Syrah, Cabernet Sauvignon and Tempranillo grapes and aged for 18 months in new French oak barrels. We select 36 barrels especially for our Club every year. The DO La Mancha Regulatory Board considered the 2010 vintage as very good. The wine from this vintage is clean and bright, intensely aromatic, with balsamic and woody characteristics and spicy, aniseed notes, typical of wines aged in French oak barrels. It is a full-bodied wine, with a long aftertaste. Priority access to our limited number of barrels every year. Custom label or back label, depending on the wine, with your name or company name on it. A single shipment within the Iberian Peninsula for free. More than one shipment: ask for an estimate. Access to Finca Valpiedra facilities, including dining room, or to La Casona at Finca Antigua for tours, meetings and events. Guided tours of the winery for members, their family and friends. Special discounts on all wines from Familia Martinez Bujanda. Get the chance to purchase the finest wines. Ideal for corporate gifts, incentive events, meetings, parties, and so on.